BigLever PLE Insight Newsletter | BigLever Software, Inc.
BigLever’s PLE Insight newsletter spotlights a variety of topics — such as the latest trends and happenings in the PLE arena, updates on PLE advances in key industry sectors, as well as observations and lessons learned from our interactions and collaboration with customers and partners. 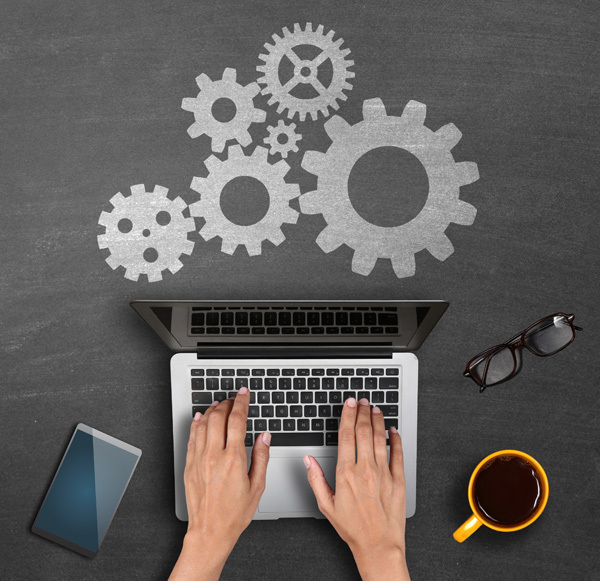 We invite you to sign up below to receive our newsletter — and we welcome your feedback regarding your organization’s PLE endeavors and challenges. 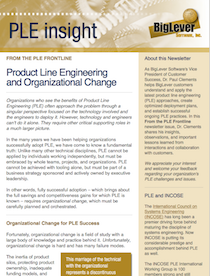 During the past few years, the International Council on Systems Engineering (INCOSE) has recognized the growing importance of Product Line Engineering (PLE), which prompted the organization’s leadership to propose and sponsor a new standards initiative with the International Organization for Standardization (ISO) on PLE. 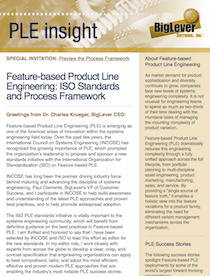 This newsletter issue highlights the ISO PLE standards initiative — as well as BigLever’s collaboration with Method Park for the creation of the Feature-based PLE Process Framework, which is derived from the same principles and practices that are being applied in the new ISO PLE standards. In the many years we have been helping organizations successfully adopt PLE, we have come to know a fundamental truth: Unlike many other technical disciplines, PLE cannot be applied by individuals working independently, but must be embraced by whole teams, projects, and organizations. PLE cannot be achieved with tooling alone, but must be part of a business strategy sponsored and actively owned by executive leadership. In this issue, I explore how successful PLE adoption – which brings about the full savings and competitiveness gains for which PLE is known – requires organizational change that must be carefully planned and orchestrated. 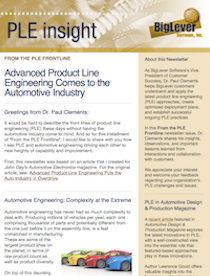 It would be hard to describe the front lines of PLE these days without having the automotive industry come to mind — an arena where engineering complexity is at the extreme. Sign up to receive our PLE Insight Newsletter.